For as long as I can remember, balloons have been making their way into weddings but long gone are the days where you see a bunch sitting in the middle of a table! (yuk). 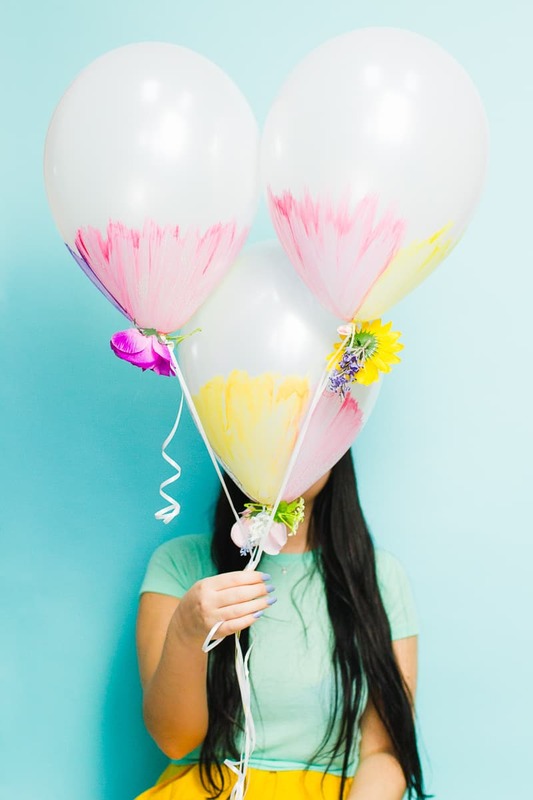 Today we wanted to share with you a tutorial on how to make your regular white balloons oh so much prettier! Turn your balloons upside down and using your acrylic paint start to brush paint up the balloon making sure to stop around half way. I found that the paler the colour of acrylic the better so mix any colours with white if you need to! Repeat again using a different colour, stopping around the same place. Finally, repeat one more time with your last colour until the entire bottom half of the balloon is covered in pretty pastel paint! Allow to dry then take your glue and start to adhere your flowers to the base of the balloon or the top of the string. I wanted to add way more flowers in than this but unfortunately they weigh the balloons down so choose your blooms wisely! Allow the glue to fully dry and voila! Job done. Pssst! Did you know that we’re crowd funding for BB Boutique?! You can check it out and invest here! So pretty. Love this idea for balloons!